Maggie Abernathy is having one heck of a summer. It was supposed to be a break from teaching 2nd graders, to have a chance to find herself again. But her recent divorce, plus a scary cancer diagnosis have turned her life upside down. Now, a little sprite of a girl has moved in next door, and now is a frequent visitor to Maggie’s backyard. Can Maggie’s new neighbors help pave a new path into her heart? This story was a perfect miss of sweet and sorrow. Maggie’s having a real tough summer. Linda Bradley doesn’t hold any punches as she walks the reader through Maggie’s radiation treatments. The little neighbor girl, Chloe, was a scene stealer. 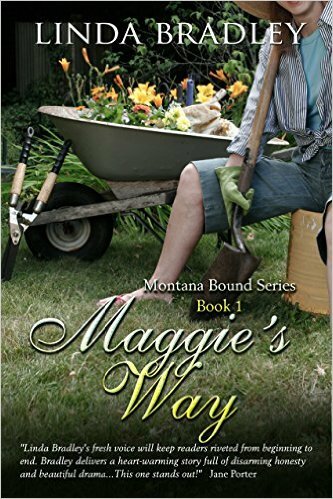 Maybe an unwelcome one at first, but it didn’t take long for Chloe to worm her way into Maggie’s daily life (and our hearts). I enjoyed the slow build up of romance between Maggie and John. I look forward to the continuation of their story.